Since the Geminid peak for 2007 is clouded over (which is nothing out of the ordinary in Ohio), I decided to give radio astronomy a try. Radio astronomy works well, even in cloudy weather, because the radio waves have little trouble penetrating the cloud cover. For meteors, one can use a simple FM tuner, preferably with a directional Yagi antenna. I lack the Yagi antenna for now, so my observation is quite limited. I used a simple unidirectional antenna, much like on a typical FM tuner. This means that it is hard for me to find a clear channel to listen on. Normally, one would point their Yagi antenna towards a distant radio source. 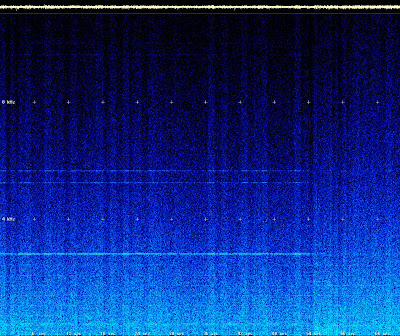 An FM radio station outside of listening range works quite well. When a meteor passes between the sender and reciever, a tone is heard. It is merely a reflection, not a product of the meteor itself. I, however, had to deal with interference from local radio stations as well. On the one mostly clear channel I managed to find, I recorded this. It appears to be a possible overdense reflection, lasting almost a minute. Please note, there is also a decent chance this is local intereference, but the dynamic spectrum resembles that of a meteor reflection. Anyone with more experience here can feel free to chime in. In the dynamic spectrum plot, note the long, horizontal lines, at approximately 3 kHz, 5 kHz, and 5.5 kHz. These are the tones I suspect to be overdense reflections. Anyone with some experience in Radio Meteor, please chime in! Marvelous article marketing. I have give preference to so you can say thanks to you a lot for your efforts most people get crafted the next few paragraphs. At present why not follow this Cash Advance With the help of using pick up fantastic post.